There are many more available via a quick web search for external IP plain text, so if one of these doesn’t work for you, it’s possible another will. To change this setting, go into the main options for TrueIP and just change the section where you define the public IP address retrieval URL. I would highly recommend that you increase the check frequency as well. If you are checking it too often, servers will often rate-limit your connections and return failure responses. 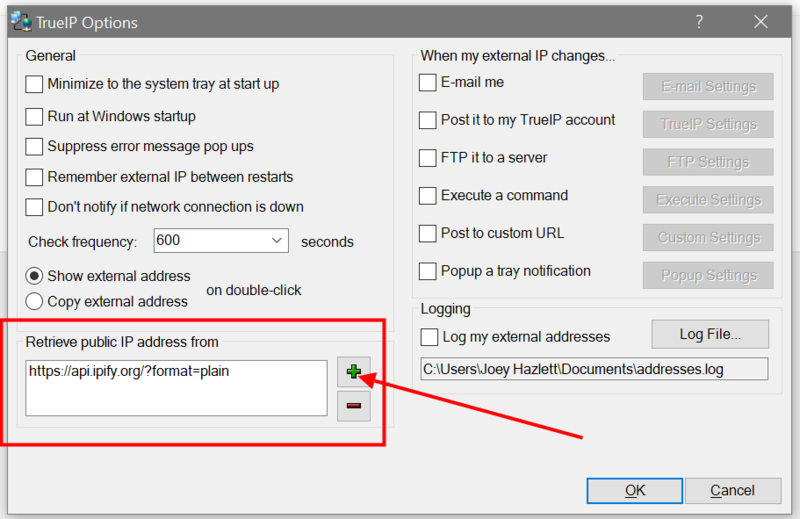 When TrueIP detects that, it assumes the IP changed because technically it changed to “service down” and so it triggers the emails/post/etc. accordingly. Unfortunately, I can no longer provide this service directly, as I have in the past. It was abused to the point that my web host cut off my site and I had to disable the script to get back in good standing with them. I also had to increase my hosting service to a business class service, which is more expensive and definitely doesn’t get covered by the meager ad revenue I generate from the site. Hopefully this post is helpful for you and this will end your frustration with the myip.dnsomatic.com service. If you have any questions or comments, please feel free to post them here or get in contact. Recently it has come to my attention that the updater tool that is released with a few different HazteK Software applications, including StorURL, has been having problems trying to check for and download updates. This seems to stem from the fact that the .NET 2.0 framework that it is built on does not support the latest version of TLS, but my hosting provider requires it for HTTPS queries. Unfortunately, this means the updater will be unable to update itself, since it is currently checking the HTTPS URL for the updates website. Since you will not be able to update automatically, you will need to download the latest version of your favorite applications to get the new updater. You can also just grab the latest updater executable directly and replace the one you current have on your system. If you have any questions, please feel free to ask in the comments section or get in contact with me directly. I use PuTTY a lot. I manage a lot of servers for my work, and I have a separate session for each one. I recently ran into a problem where a significant number of my sessions were rendering weird characters compared to some of the others. After troubleshooting for a while, I finally found information that said PuTTY was possibly the culprit. Since I had some sessions working, but others were acting strange, I started poking through the settings trying to figure out what was different in PuTTY. After banging my head for a bit, I decided there had to be a better way. I did some searches, and I couldn’t find anything on the internet that would do exactly what I wanted to do, which was compare two registry keys to see what values were different. I could eyeball it, of course, but why not let the computer do the hard work for me? Since I couldn’t find a pre-packaged solution on the web that specifically worked with registry data, I decided to write my own. Introducing Registry Key Diff. It’s a very simple tool that allows you to compare two keys to see what might be causing your problems. For me, it ended up being a character encoding issue, but some of my sessions were configured properly, while others were not. I used the new tool I wrote to copy the encoding setting to all of the other sessions, and everything is happy now. Anyway, I figured I’d clean up the application and share it with everyone. Who knows who might be out there needing to do something similar to what I wanted to do. If you’re interested, head on over to the application page to download it and check it out. I was searching the web today, and I realized that my browser had stored thousands of previous search queries in its database. I’m one for privacy, so I felt like I should clear those out. If anything, cleaning them out should help to keep the system running smoothly. I went into my Firefox settings to find the way to clean them out, and I realized that there was no easy way to do so. The search history is tied together with the form history, so if you clear out your searches, it will also clear out any saved data you may have to auto-populate forms. That doesn’t make sense to me, so I searched for a way to fix that. I asked on the Mozilla support forums, and got the standard response: use an extension. Well, the extensions that do this are convoluted and actually do a lot more than I needed. I just wanted to clear my history without doing it manually by holding the delete key down for 20 minutes. I started poking around in my profile directory to see where this information might be stored and found the location. It is saved in the same database file as the forms data, which makes sense as to why they are tied together in the application. Fortunately every entry for the search history has a specific field name, and makes it easy to manually clear just that, and nothing else. Now, I could have just used sqlite3 to wipe out the data, and be done with it, but I wanted an easy way to do this again in the future. Firefox Search History Cleaner is born! It’s a tool that does exactly what I want, and nothing else. To use it, all you need to do is launch the executable and click the Load Database button. It will find your profile automatically (if you have more than one, you will have to choose) and load your search history. You can sort it by search query or date, and select specific entries to delete or delete them all. Everything is driven with a few simple buttons. Before you delete your history, you can export your search history to a text file for later reference. If you’re a Firefox user, and you hate that you can’t clear your search history, then check out this tool and see if it’s right for you! Today I’ve posted a new application called Countdown Max! It’s the next generation countdown application, which replaces the previous Countdown application available on the site. It does everything the original one did, but allows for multiple different countdowns simultaneously. It also runs in completely portable mode, which means that all configurations get saved in its local directory, it shouldn’t leave its mark on any system it is run on. It only comes in a ZIP file, and is actually just a single executable that can be run from anywhere you have write permission to. If you are anticipating an event, and want to see how long until it happens, check out Countdown Max! On the StorURL front, a new version has been posted, 3.0.23.1. With this new version come a few new requested features that made sense to add to the application. Each category will now remember how it was last sorted, so no more sorting every time you jump around. A couple of new columns were added to the main UI, “Date Added” and “Credentials.” The first is obvious, but the second is a column for quickly identifying which sites have credentials saved for them with a Yes/No value. Clicking on the site will show the username in the site information pane, but the password is still hidden until you open the site’s properties (for shoulder-surfing security purposes). Last, but not least, you can now re-order the columns, and their sizes will be remembered between application restarts. This means you can move each column around however you’d like, and even size a column to zero pixels wide if you don’t care to see it. Check it out by downloading from the StorURL application page, or by using the built-in updater to update to the latest and greatest. I had some free time this weekend, and spent it updating a few of the applications on the site. StorURL has been updated to 3.0.22.0 and TrueIP is now at version 2.0.8.1. StorURL now has auto-fill available from the main UI. This will allow you to automatically retrieve the Title and Description for all sites in a category, or just the selected ones. TrueIP now has the ability to immediately open the log file directly from the right-click menu. It also supports portable mode. Just add a portable file into the application directory, or just download the new portable version. As always, check out the StorURL and TrueIP pages for the download links. Coming soon is a new version of Countdown called Countdown Max! It supports multiple countdowns and a more portable format that doesn’t rely on the registry to function. I’ve been using it for a few years now, and slowly making tweaks as I deem them necessary. Stay tuned for more information. In the world of dynamic DNS, there are many different providers, and not so many clients that support those providers. Today I released a new version of TrueIP that allows you to specify custom URLs, fields, etc to GET/POST to. I personally use the dynamic DNS option with my domains for various dynamic hosts. I use Namecheap as my DNS provider at the moment, and it is fairly easy. They supply the information necessary to get set up and start using a dynamic updater on their website. I have not tested with any other providers, but from little research I have done, this should work with the majority of them. If you are interested in testing, please let me know your results, and I can update this post and the TrueIP page. Currently, this has only been added to the desktop TrueIP client, but soon I will also implement this feature into TrueIP Service Edition. Update, both the desktop and service versions of TrueIP now support this feature! Check out the change log for more details. Note: Please uninstall any previous versions of TrueIP, as this new version is installed in a new location to be consistent with other HazteK Software applications. I’ve been working on a new version of Simple Phone Book over the past week in my free time, and I think I’ve got it to a point where I can release it now. This new version is built on the same engine as the latest version of StorURL, so it was pretty easy to crank out. I tried my best to replicate the functionality of the previous version of SPB while making it more stable and functional on modern operating systems. It has been tested extensively by myself on both Windows 7 and Windows 10. If you were interested in using SPB but found it to be unworkable on modern versions of Windows, try this new version out. In addition to releasing this new version, I’ve made a few short how-to videos on how to get started with the new version. Check them out if you feel the urge.